The small grain survey will be run jointly across Minnesota and North Dakota beginning in late May. Unlike the 2012 season when the survey started when the crop was already in advanced growth stages, this year's survey should begin when the crop is young and significant pest issues won't have begun. 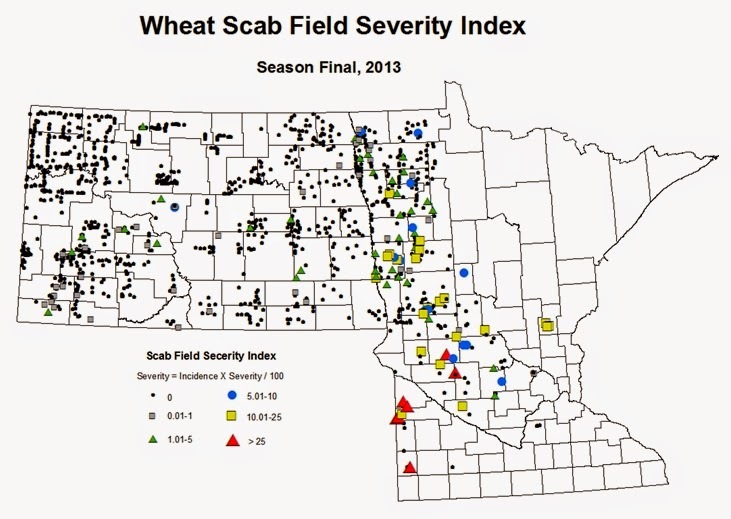 Geo-referenced maps will be generated weekly to present an overview of what field scouts are observing in small grain fields all the way from southern Minnesota to western North Dakota. To familiarize you with these maps, here is the 2013 Survey Map plotting the location of all the field sites visited for the survey period. Crop stages and pest populations will be reported weekly, with most updated maps available by Tuesday and reflecting the previous weeks results. An example of pest categories and how observations will be reported is illustrated by the 2013 Survey Map for Scab Incidence. The Minnesota portion of this project is funded by the Minnesota Association of Wheat Growers. The program is coordinated with the North Dakota State University Extension Service and its IPM Program.